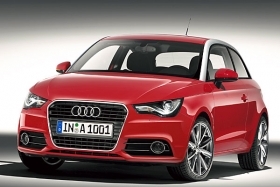 The A1, pictured, is part of Audi plans to expand its lineup to 42 vehicles by 2015. (Bloomberg) -- Audi AG said sales rose 15 percent in May because of growing demand from Chinese consumers, and predicted the new A1 subcompact model will help it win more customers in Europe. Deliveries worldwide increased to 94,900 cars and SUVs from 82,803 a year earlier, Volkswagen AG's luxury brand, said. Chinese sales jumped 40 percent to 17,396 vehicles. Audi is introducing a dozen models this year, including the A1 hatchback, a coupe called the A7 and a new version of the flagship A8 sedan, as it expands the lineup to 42 vehicles by 2015 from 34 in 2009. Audi said in May that it aims for earnings before interest and taxes to rise faster than revenue this year. Audi is aiming for deliveries to exceed 1 million vehicles in 2010, an increase of more than 5.3 percent from 2009. That compares with a “sound single-digit percentage” sales-gain target at BMW AG and a plan by Daimler AG's Mercedes-Benz to outpace market growth of 4 percent. Daimler, the world's second-largest luxury-car manufacturer after BMW, yesterday reported a 17 percent jump in Mercedes-Benz sales last month to 101,400 cars and SUVs. Daimler's sales in China, where the company has a target of selling at least 100,000 vehicles this year, more than doubled in May to 11,500. Audi's five-month sales gained 22 percent to 455,700 vehicles, the carmaker said today.